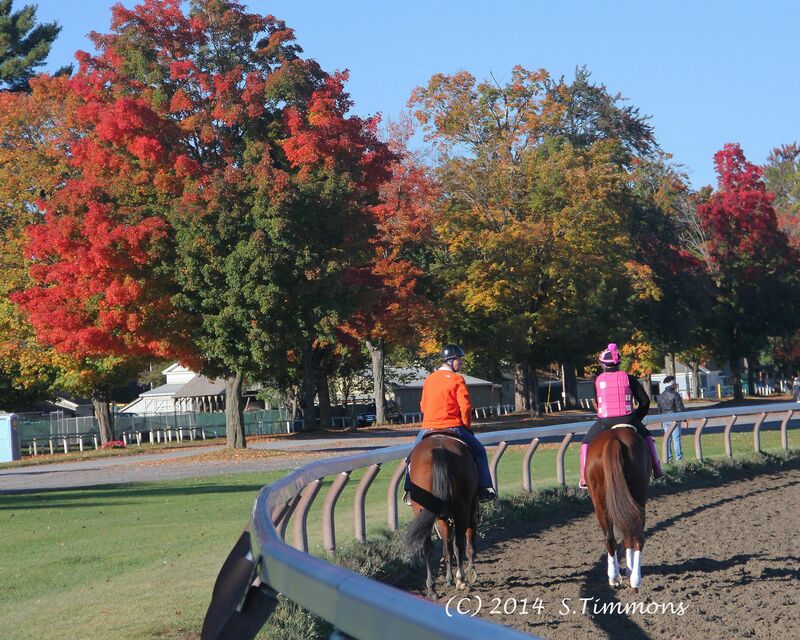 I was back at Saratoga again this morning for a "Photo Finish" tour of the barn area at the Oklahoma training track lead by photographer Dona McAdams. It was a sunny day, as 15 of us walked around as a "pack". It was a sweet way to end the summer, as I got to see our favorite 2 year old in training again! After my early morning tour, I was not able to go to the races today at Saratoga, but it was a big day! Show 3 Vyjack	Irad Ortiz, Jr.
Sally, thank you so much for all the great pictures - I'll get up there one of these years! This is a duplicate of my CoZmic post- as these have been my primary discussion threads of the summer. Thank you all for the positive feedback you have given me over the past month or so on my Saratoga & CoZmic pics. Photographing these amazing animals gives me a focus, and brings me a peace of mind that I treasure. VA, We were a PACK of people, so I think CoZ was looking at all of us-we were impossible to miss! One day recently, when I was shooting, a man leaning on the rail turned to me & commented "did you see that horse look right at you?" When I'm sorting through my photos, I often notice that they're looking at me out of the corner of their eye. I really try NOT to attract their attention though, as they need to be focusing on their workouts-but they're so smart-they don't miss a thing. The leader of our group was very strict about our movements, (which is a good thing). We didn't get as close to the horses or the rail as individuals can, because we were such a large (distracting) group. When CoZ was returning to the barn, we were all gathered at the end of it, in a cluster. John turned down another path, and our leader presumed we were in the way. She immediately told us to move down the road, so John would feel comfortable (that we were gone) and could bring CoZ back in. Our leader, Dona, knew quite a few of the people we encountered. Such as the man in charge of the schooling gate. He invited us to come right up to the rail, for a better view of a horse being trained. We didn't move up though, because the rules of the National Racing Museum (that runs the tour) wouldn't allow it. (We had a museum representative with us along with our photographer leader). It's pretty amazing that they (Saratoga & horsemen) even allow the tours, so you have to be super respectful, and Dona was very good at communicating this, and guiding us. I take photos of ALL the horses, because as they're coming at me, I usually don't have any idea who they are. There was a nice young man named Mike, (he was a clocker for an individual) up in the viewing stand, every day, by dawn. He would give me a heads-up when someone famous was out on the track, or heading our way. He was such a great resource! His boss & friends were also great resources when they'd stop by. Sometimes I might figure out who a horse was after they had passed, when I could see the saddlecloth, or ask Mike. I will never know who most of them are, but they're still amazing to watch & photograph! I will admit that I'm always scanning the area for CoZ, and my heart goes all aflutter when I spot him! For those of you who have made it through my post-I honestly didn't know if I would be home in VT at all this summer. Family comes first. My elderly Mother has been battling advanced cancer for 2 1/2 years, and my Father joined her in his own battle with cancer last year. It has been a long & difficult road, especially since they live 500 miles away. (I've made over 20 trips down to see them). I was able to alternate a couple of weeks with them, then return home for a couple of weeks, and repeat. I had tickets to the Traver's, but had no idea if I'd actually make it-BTW I did! I'm back in school again, my students all returned as of last week, so my need for distraction dims, as the Saratoga meet comes to a close. My trips to watch and photograph the horses have been my attempt to seek respite from the mental & emotional chaos that reigns in my world at this time. Thanks for all your support! SallyT, my husband and I have started a conversation about going to Saratoga on vacation next year. You've inspired me. SallyT, Thank you again for all the trips you have taken us on this summer. 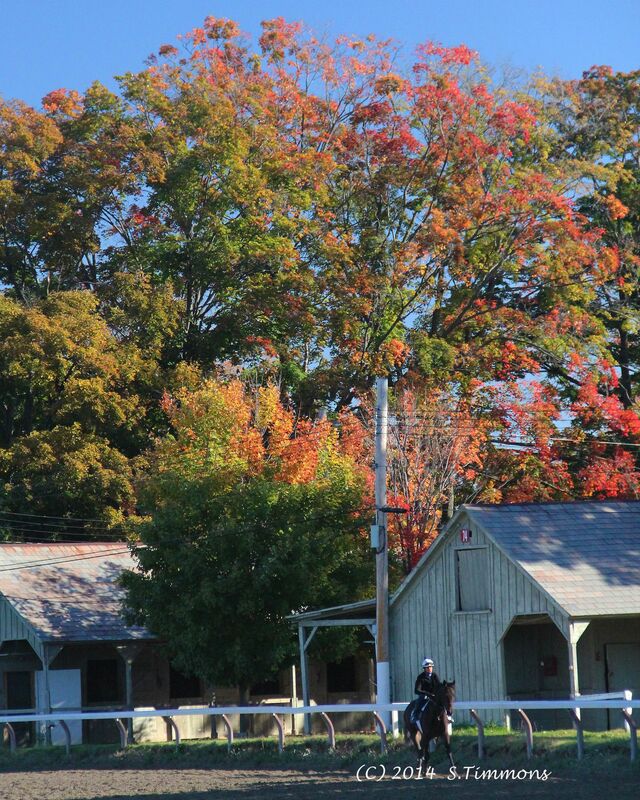 Saratoga is a beautiful place. I will miss those journeys this winter, but will look back on your pictures and remember. Posted another message to you on the Cozmic One thread. Take care of your students and family! God bless! Just watched Tom Durkin's last call. Emotional. 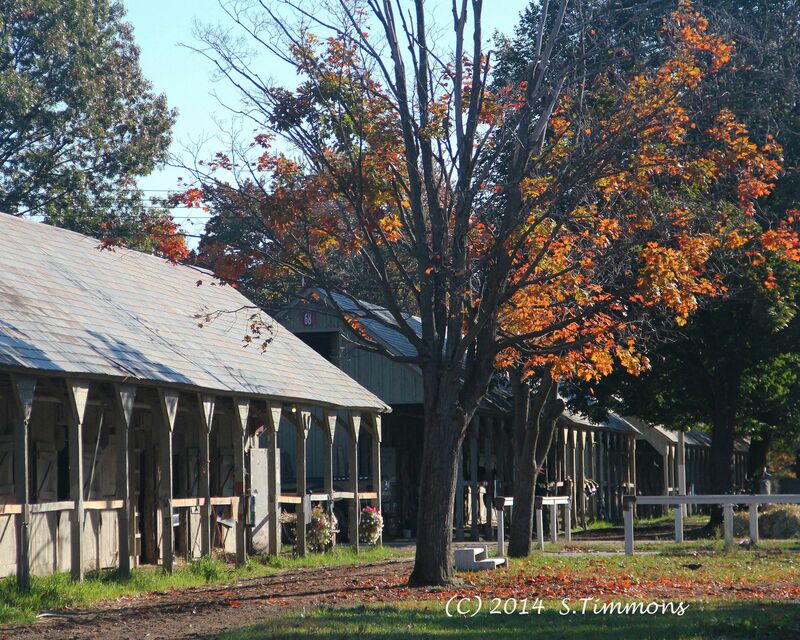 I believe that anyone who is a horse racing fan, should have a trip to Saratoga on their "bucket list"! Visiting Kentucky, the horse farms & Horse Park are on mine. I met a man last summer who is retired, and spends his time traveling to the different tracks, taking photos. He had been to all the triple crown races, and was spending the summer at Saratoga. He was heading to California next. That sounds like a perfect retirement to me-I hope I can make it to that point! I have many more photos to sort through this winter, which will put a smile on my face during the snowy days after the Breeder's Cup. I'm still learning about posting photos. I opened the Imageshack account so I could share photos with everyone here on the forum. I kept some albums private, as the watermarking feature was not working consistently. Once I was able to get photos watermarked, (In order to do that I had to repeatedly upload the images,) I made most of my photos public. But some of the links I posted in the forum, are now broken due to the uploading issue-sorry about that. But the photos are still there, and are mostly public. If anyone knows how private folders, (that were not shared with anyone) can still be viewed, please explain it to me. I saw on the image stats that some images that I've never shared, located in private folders that I've never shared, have been viewed. I don't understand how that happens. Thanks VA, good idea-I just did. I just found that Imageshack has changed things up-I needed to use the photo icon in the posting menu to get these to appear. Beautiful photos, Sally. My parents used to take the ride over to Saratoga in the fall. (They only visited the battelfield,) The fall coloring looks beautiful in your photos. How is it in Vermont this year? Sadly, the last fall I was there--1998--was a dull year. Too much rain and overcast skies. Still, VT is the best for fall coloring, esp. compared to the rest of the country. It's all those wonderful scarlet sugar maple trees. That's interesting SallyT...I just did a couple of direct photos (HTML) in a draft I am working on and I had no problem getting that HTML link to do a direct image posting. I use Imageshack most of the time so have you checked that your "formula" is notated as HTML instead of Direct (URL) under the "Get Links" screen? The reason: Kylea said that green icon is to be used when you have an image URL (what you would get if you click on DIRECT) for it to work as intended. Earlier, I remember you had used an HTML link posted using the green icon which is why you had extra text showing amid the image. Another easy access which I use all the time: I click on All Images on the left black border then when my images show up...below each image, there is an icon with 3 parallel bars. I just click on that and a drop down screen opens. I then click on the "white" window that gives me the choices for direct (URL) or HTML as well as sizes choices. btw...once you click the 3 parallel bars, you also get choices like delete, edit, rotate, make public or private, etc. URL (aka DIRECT) = link to an image or site...no photo shows up. This url formula is what you use to input into the green icon above the posting window. 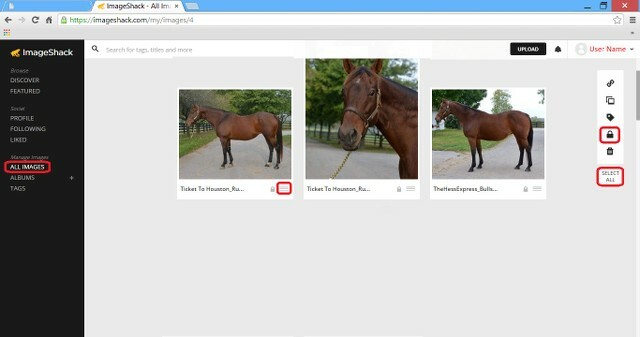 HTML = formula to get a directed photo to show up in your posting window without needing to use the green icon above the posting window. Also...if you intend to input a copyright watermark on an already existing image...once you change your image, you might create a broken link. My suggestion...sadly, is to input your copyright water mark first then upload it into ImageShack. Double work I know but this way you don't corrupt your image link. You can also make previous images private so no one else can view this un-watermarked photo. However, I haven't tried this yet as I watermark before uploading, but you might try out that edit option under the 3 parallel icon to see if you can test an image by editing it by adding a watermark without breaking the link. Also, it might appear that others are viewing your photos when you click onto your image as well...so it might also include your personal viewing of the image. Thanks for the info Paniolo_Gal. I checked on the HTML, and apparently I did a different step to get my link before- I can see now what you mean. The watermark issue is hopefully solved. I was watermarking as the images were uploaded. The problem was that it wouldn't always work-it was sporadic. I wrote to Imageshack, they responded, and I think they have fixed the glitch, as it works consistently now. Glad this issue was solved! :oD Happy posting with watermarks! SallyT, your pics are beautiful! Fall in the North is my favorite time of year. The trees look like there will be great color this year. I need to visit my daughter in Cincinnati to view "real" Fall colors. Florida tree colors are not available here until at least the end of December. I'll work on this addendum later in the tutorial thread...but this is the ImageShack page showing the 3 parallel lines directly below the uploaded image which I click to get a drop down screen. I use the 3 parallel bars because it allows me to see what image I am posting first before I proceed in selecting HTML and size for posting, etc. Also shows the privacy "Lock" icon and the drop down arrow next to your user name to get the help option. You will notice the privacy "Lock" icon is indicated under each of my photos. louisespadafora, whereabouts in Florida do you live? Fall coloring is similar to Florida, I guess, here in my part of SoCal. I have crape myrtles that get red and gold fall coloring--depending on the temps; they are more red if it's good and cold.. I also have white birches that turn gold, and a big liquidamber (aka sweet gum back east) that gets red leaves if it's cold enough. This usually happens in late November and into December. The colored leaves hang on until the end of December unless we get really fierce Santa Ana winds that blow them off sooner. Louise & VA, The colors have already peaked up at Killington, so I headed south in the hopes that I would have better luck at Saratoga. I think the color will be great for the tourists on Columbus Day weekend. The majority of the trees around the track were green with many "pockets" starting to turn. VA mentioned the sugar maples which are spectacular. I'm in the foothills, and we're peaking now. I live in the woods, and everything seems to glow; the carpet of leaves on the ground reflects the light, and there are still a lot of leaves on the branches, filtering the sun from above. Nature is amazing! The beauty of the fall never ceases to impress. Thank you for the beautiful word pictures, Sally. They made my tear up and long again for my childhood. (Something I do a lot now, the older I get and the less agile and athletic and able I become. Sigh.) But I REALLY miss Vermont at this time of year!!! SallyT and VA_in_CA, I lived in Northern Ohio in the country when I was growing up, and most years the fall colors where just gorgeous. The Sugar Maples and the Tulip trees were the most spectacular. Living now in Central Florida, I find most years that the fall colors arrive in late December. In Florida we have the Florida Red Maples that turn bright red before dropping their leaves. The Red Maples, Custard Apples, and Turkey Oaks can really put on a show when mixed with native palms and Live Oaks. The colors are a Christmas treat. Then within a few weeks, they all sprout new leaves and Spring arrives! We truly have no winter!